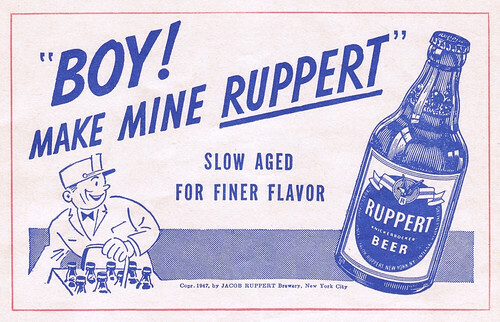 Wednesday’s ad is for Ruppert Knickerbocker Beer, from 1947. Ah, what innocence … a time when yelling “Boy!” was considered acceptable. He looks more like a milk delivery person, but I assume it’s meant to be at a baseball game, meaning it’s also odd that they’re showing glass bottles. I also love that slogan. “Slow Aged for Finer Flavor.” As opposed to fast aging? Beer vendors working the stands @ baseball games carried glass bottles well into the 70’s, pouring the brew into a paper cup. Doesn’t exist in CA any more – one has to go to the nearest concourse to get a brew. In most other MLB parks, the beer guys still ply the stands (serving crap in plastic bottles/pouring crap from cans into plastic cups).